← Tom Cruise as ANOTHER secret agent? “The Man from U.N.C.L.E.”? There’s been talk for the better part of a year, a little smack here and there that claims that James Franco based his drawling, hoodlum/rapper/pimped-out Camaro driver “Alien” in “Spring Breakers” on one guy — Houston-based rapper Riff Raff. 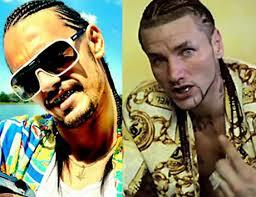 A lot of this trash talk has come from Riff Raff himself (pictured above). I know Franco has answered this before, and he sounds a little annoyed when I ask him about the connection. But hey, it hasn’t gone away. “I went to a lot of places for Alien. I like Riff Raff a lot. I think what he wants, though, is basically what you’re doing right now. Which is to start a discussion about him. That’s what all this is about, him grabbing attention. “When we were researching the movie, Riff Raff I don’t think even had a record deal. But Harmony (Korine) sent me a couple of his videos. But he also sent me other peoples’ videos, HUNDREDS of things. Alien is an amalgamation of a lot of guys like that. I don’t think Riff Raff has seen the film, so he’s basing his opinion that I’m playing him on the look. We’re both white guys with cornrows. It’s not a stretch. So yeah, I was aware of him, but Harmony was showing me tons of things. And the look? The costume designer and hair people and Harmony were the ones who came up with that. I wouldn’t know where to start, building this guy’s look. “And the character’s inner life I based on this guy named Dangeruss, and customized him with an accent and everything to make him local. Either way, both of these guys were laboring in something close to obscurity before the film came along and stirred up interest in them. So everybody wins, right? (Roger Moore’s review of “Spring Breakers” is here).